Pinball Roulette is an arcade game that is a combination of roulette and pinball to create an exciting mixture that will delight fans of both roulette and arcade games. 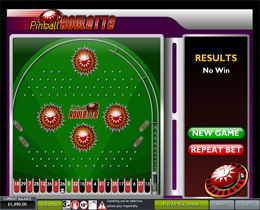 Pinball Roulette bridges the gap between regular casino games and instant games in a modern format, making these games very available to a wide range of grateful players. The aim of the game is to guess where the ball will stop on the roulette strip which consists of numbers 1 to 36, alternately coloured red and black, plus 0, which is green. Placing a bet on this game is the same as placing a bet on a regular roulette game. You can have a Straight Up or a single number bet, or a Split bet or even a Street bet where you bet on three numbers on a single vertical line. Other bets include a Corner Bet where you bet on four numbers, Four Bet where you bet on 0, 1, 2, and 3, Line Bet, Column Bet, Dozen Bet, Red/Black Bet, Even/Odd Bet, Low/High Bet and Neighbour Bets. Although these bets sound complicated to a player unfamiliar with Roulette, the betting board has been laid out logically, making it very user friendly. You can choose multiple betting denominations from $0.01 to $25 and simply click on the betting area to place the bet. At this time you can either use the Turbo mode (which plays the game out without animation and is quicker or you can click on Bet). The Auto Bet feature allows you to play the game in auto mode and you can choose whether to play 1, 2, 5 or 10 consecutive games with the same bet. All the numbers that you placed a bet on are highlighted on Roulette strip and marked with a chip on the Roulette board next to the pinball section. If you win a round, you have the option of gambling your winnings by playing the bonus round where the ball is launched into the pinball playfield. If it bounces against the multipliers, you win twice your bet amount.